Right then, remember when I said I was going to finish the narrative arc set in Okami’s past? Yeah…about that…I think it was a bit of an over-ambitious goal. On a positive note, I found a shortcut to the top of Hirata Village, whereupon I killed some more idiots in their underwear. Along the way I did some world building by chatting with friendly NPCs and a rather chatty looter. Then I ran into this beefy, poison-spewing mother fucker and I died about six times. This is okay. I am used to this. You don’t want to know how many times I went to the New Londo Ruins in Dark Souls before getting a cursed weapon, thinking that sprinting and misery was my only way forward. See I have this stubborn streak, and the first rule of Souls Club is to accept that while failure is part of the experience, repeated failure can often be the game’s way of nudging a player on to a different course. After six deaths I considered there might be an attachment to Okami’s prosthesis that will make it easier to fight Chonks Ahoy. Could be that there was a sword art I hadn’t yet unlocked. 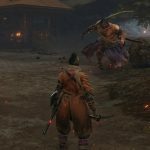 I suspect internet jags would tell me I need to “get gud.” From my point of view, progress in Sekiro/Souls means one has to let go of their preconceptions and learn the systems of the game. 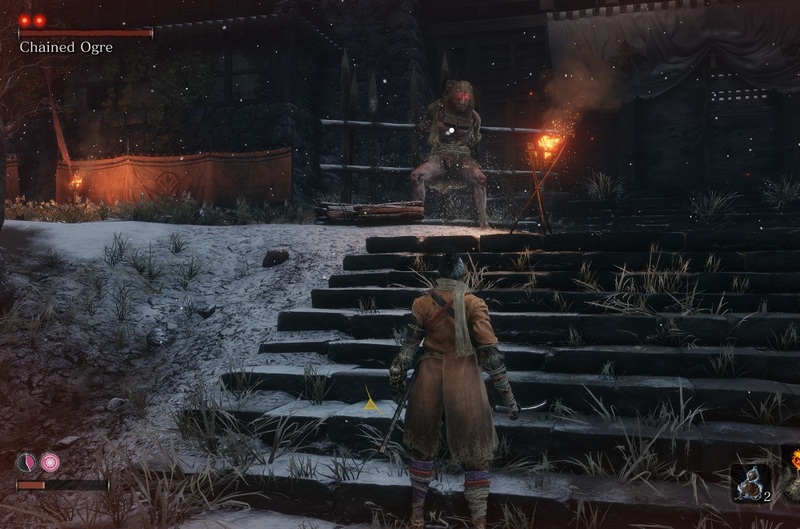 Rather than beating my head against Sempai Spewface, I backtracked to the Ashina Outskirts. Carving up the hammer man from part 2 proved pretty easy. Who would have thought that throwing oil on a guy and then lighting him on fire would be an effective distraction against oncoming sword thrusts? Dispatching that particular non-threat led me to an actual boss fight. More on that in a moment. See, I found something unexpected on the way to the boss fight. I had another run-in with the blind old woman who gave me the bell that unlocked Okami’s past. It turns out she is also sick with…wait for it…Dragon Rot. More on that in part four. What stood out from this second encounter is how the writing has her double-down on thinking that Okami is her wayward son. Where I expected gruff disinterest from Okami, he leaned into it. He let this old woman speak to him as her son. I was not expecting kindness in a game that facilitates endless murder like it’s an early 90s anime. Then things took a further turn toward the unexpected. The second NPC I met on the way to a boss fight that stymied for 90 minutes, was an older version of the chatty looter from Hirata Village. He even remembered my interaction with him in the past. My choice to talk to a random NPC in the game’s objective past had a carry-over effect into its present. This isn’t just simple choice in a game, this is choice and causality. I think I see this game’s deeper hook. I’ve talked endlessly about how Dark Souls’ level design and architecture is an intentional layer in the story telling. Before chatting with the looter I wasn’t feeling that with Sekrio. 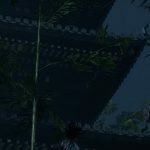 Now I see the setting is using a different type of architecture to augment its story. 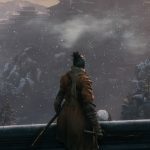 It’s not the physical space of Sekiro that paints the subtext but the temporal relationship between past and present. 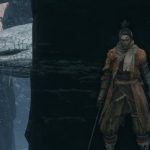 There’s going to be a push and pull between the sworn sword that Okami was, and the broken man we find at the start of the game. I suspect the common thread between both past- and present-Okami is his devotion to Kuro. This feels like something with a lot of potential. He feels like a hero, albeit a broken one. That said, I swear this game will break my heart if it turns out that Okami is a contemporary take on Darth Reven. Okay. You’ve been good and listened to me talk about feelings and causality. Let’s give you some of what you came here for: Adam getting ruthlessly pounded (phrasing) by an ogre. 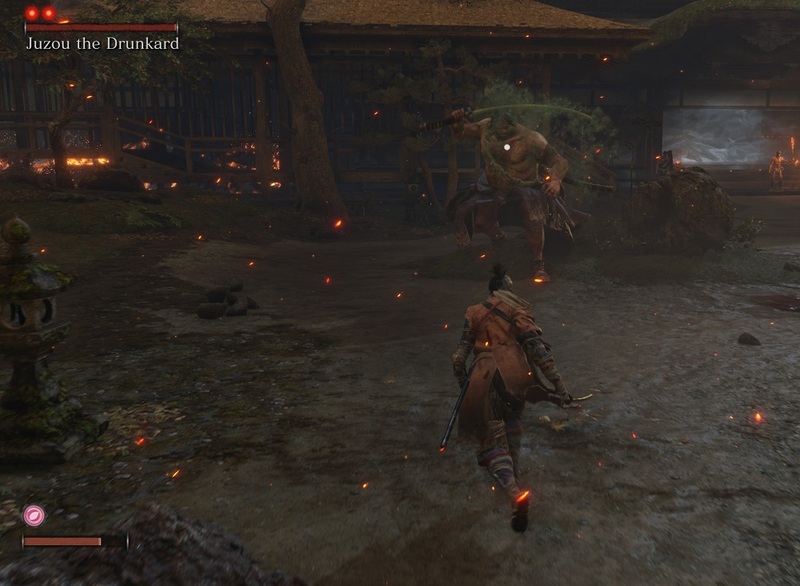 I’m not going to lie and say that the fight with the Chained Ogre was a walk through the park. He killed me way more than the Taurus Demon in Dark Souls ever managed. He has spin kicks and pile drivers that could knock a shinobi into next week. His coup de grace is a near-to-one-shot-kill bear hug/ground and pound. This proved a challenging fight. Some people might call beating him proof that I “got gud,” but I’m choosing to see my victory as a willingness to not be stubborn. I mean, he’s an ogre. He’s strong and reasonably agile, but not nearly as fast as Okami. Once I started using the sprint button, my technique of “wack, dodge, grapple, wack” got me where I needed to go. I may have also torched him with my flamethrower once or twice because the loading screen text said anything with red eyes is weak against fire.